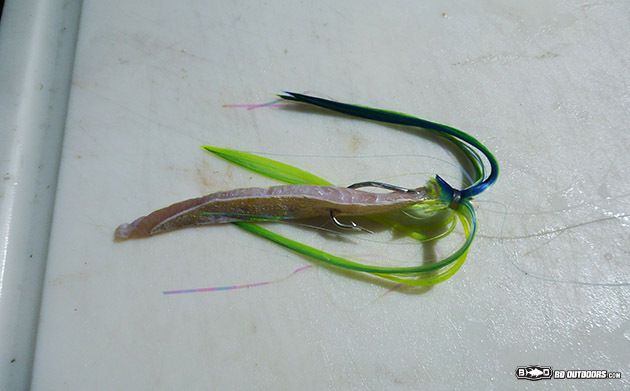 I’m continuing our exploration of the some of the many uses for belly strips made from dorado, little tunny, or mullet. 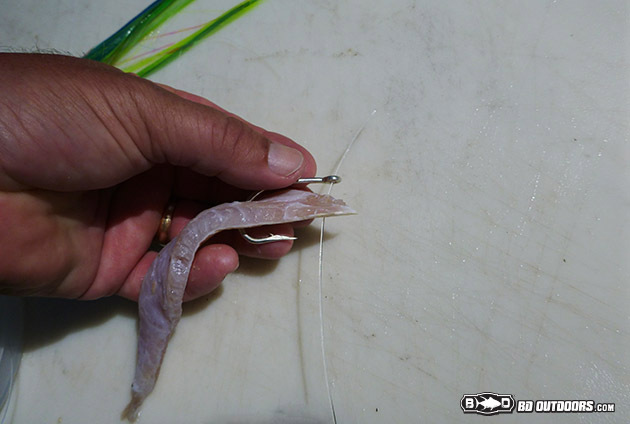 Here I’m using dorado belly, one of the toughest, to rig a light weight monofilament leader for dink fishing or regular trolling. You can adapt the leaders weight and hook size to match the gear you will be trolling with. I use 50# to 60# mono when using 30# class reels. Besides being one of the fishes’ favorites, the strip bait benefits from being so durable and you can get multiple shots from an attacking fish and the stripbait will continue to swim and drive them crazy until the hook finds its way home. 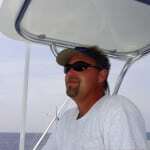 It is a great bait for spots in the spread where you cannot readily see the condition of the bait. The shotgun (way back bait) is my favorite because it is your last chance as a fish leaves the spread and you can have confidence that your bait is intact, unlike a ballyhoo that easily blows out from water pressure over time. You can also benefit from the multiple bite aspect as you work to get a fish hooked up. The deep line, be it trolling sinker, planar or downrigger is another spot I put the strip bait, because the if the strip gets bit, the skin is tough enough to trip the clip or cause a rod tip to bounce. 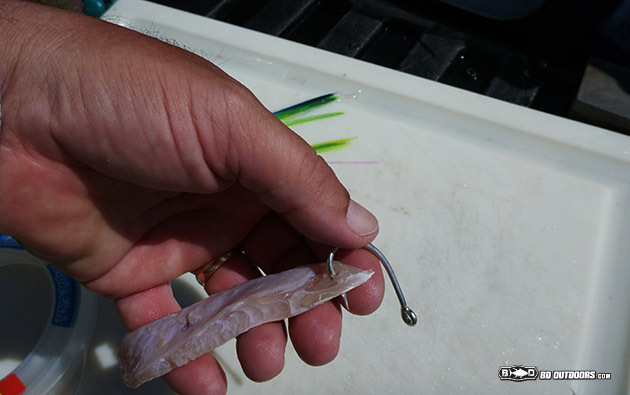 A ballyhoo can be cutoff by a toothy critter without doing either of these indicators. 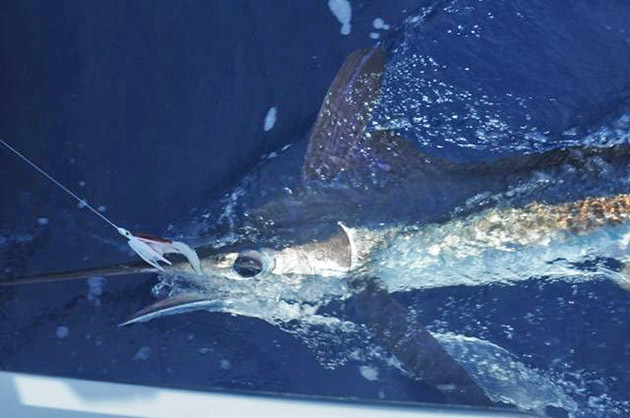 I normally would put wire leader on a deep-line as I would be looking for a wahoo with a mouth full of teeth. That is the theory, so here is how to rig it. It is very simple and so good. Of course the belly strips should be prepped ahead of time and standing by. 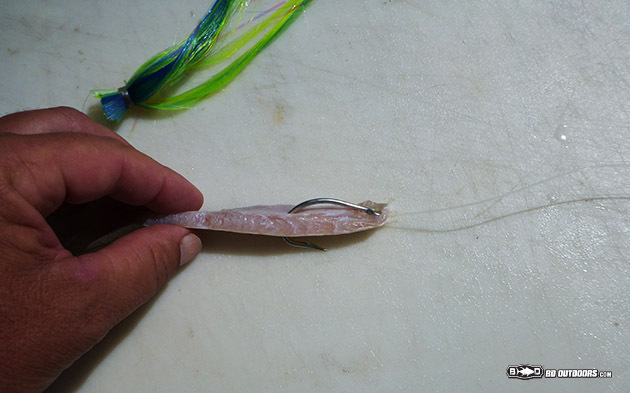 Here is a refresher on how to make strips from your previous catches. 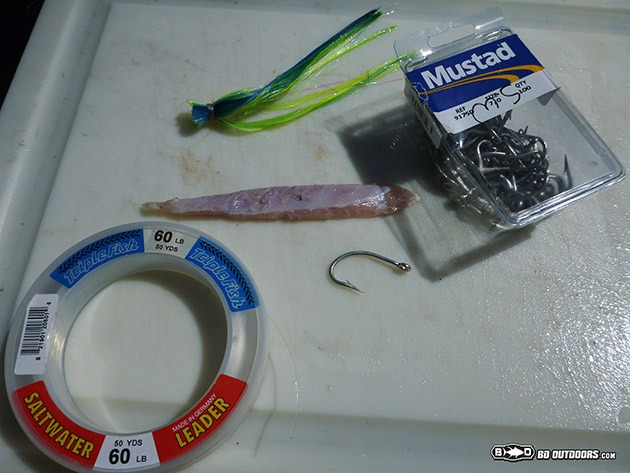 For 30# class fishing, I use a Mustad 9175 short-shank live-bait hook in a 6/0 – 7/0 size. Sharpening and coating with a sharpie should have already been done at home. 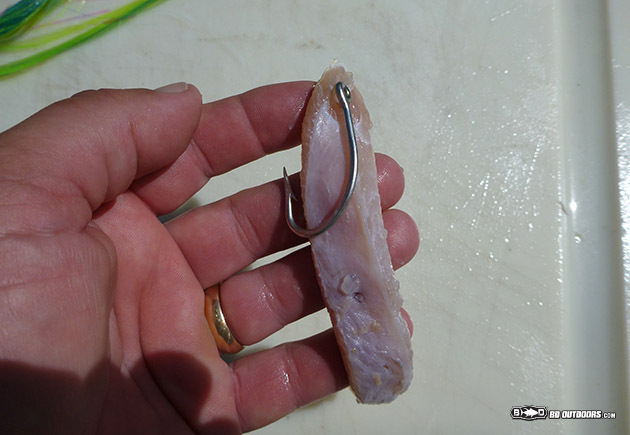 Take your hook and carefully make a hole in the front end of the strip by poking the hook into the meat-side and out the skin. Do not go past the hook barb! You are just making enough of a hole to pass the 60# mono leader. Now lay the hook on the strip with the eye of the hook lined up on the hole in the strip. Make note of where the curve of the hook will pass through the strip when it is laid out straight. Go ahead and poke the hook through this spot from the meat-side first. It is harder to poke through the skin-side because of the scales. Now pass the leader though the hole on the skin-side and the eye of the hook. Pull a generous tag of 8-inches or so to tie a uni-knot. Tie a standard uni-knot in front of the strip and partial tighten to begin the formation of the knot. Now as you cinch the knot tight, the knot will slide down to the hook eye and cinch tight against the hook and the skin of the strip. Trim the tag and you are set. 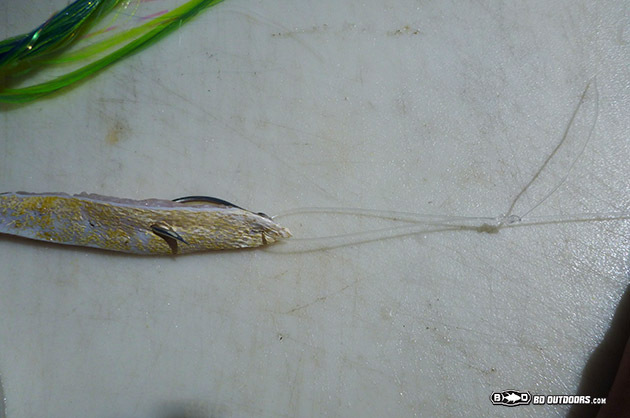 I always use a small lure head in front of the strip to streamline the end and give the desired look. I keep it small and easy for the fish to eat. A small seawitch is my go to lure. One other version and actually the original one I learned is to use crimps to make the connection to the strip. This is most beneficial as you go up in leader size. I use crimps for any mono leader heavier than 60#. 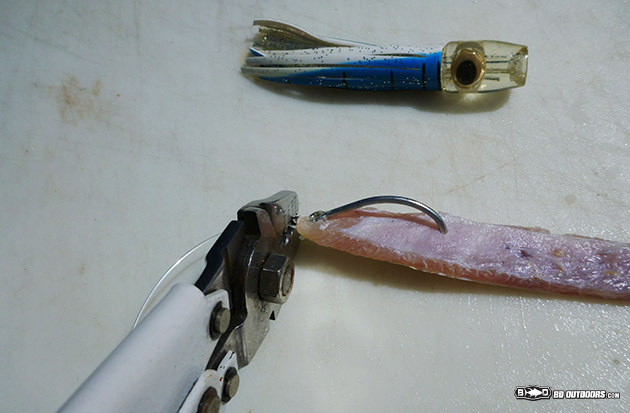 Just pull your loop down tight against the bait and crimp. 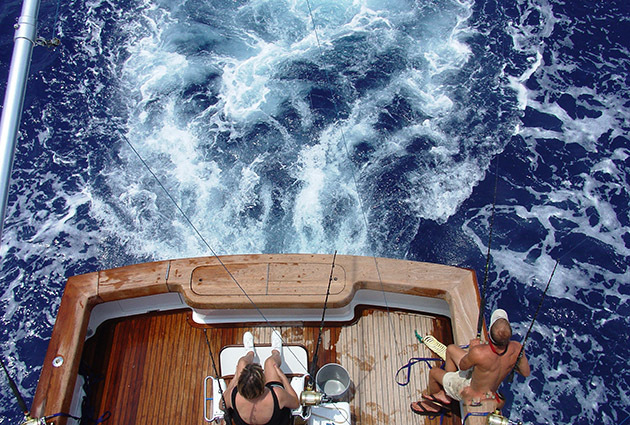 Get more rigging and fishing tips from Capt. Scott Goodwin on BD. Share the Gulf – Protein for America?